World Tapir Day receives coverage around the world. Here are a few links to short news reports, mentions and more in-depth articles, as well as a few social media/Internet highlights. Articles from past years will continue to be added, and new articles will appear as they are published. If you come across something to which we should link (regardless of the language in which it is written), please tell us about it! 2016: New Straits Time, 3 May, "A shout-out for the tapir "
2016: The Telegraph, 27 April, "World Tapir Day: 24 reasons tapirs are your new favourite animal"
2016: 9 News, 27 April, "Majestic tapirs in the spotlight on World Tapir Day"
2016, Rakyat Post, 20 April, "Endangered tapirs killed by motorists"
2015, Metro, 27 April, "13 tapirs to sum up your Monday on World Tapir Day"
2015, Globo, 27 April, "Dia da Anta é celebrado nesta 2ª feira; quatro espécies estão em perigo"
2015, Szabolcs, 27 April, "Ugye nem felejtetted el, hogy ma van a tapírok világnapja?" 2014: News and Star, 26 April, "Tapir Day at Cumbria Zoo aims to secure species' future"
2013: Denver Post, 22 March, "Carroll: Happy Tapir Day, Colorado!" 2013: World Land Trust, "We did it for tapirs! Zoo keepers were ‘really scared’"
2012: nj.com, "Bergen County zoo honors underdog mammal for 'World Tapir Day'"
2012: Yahoo! News, "Tapirs on the edge: Humans to blame for falling numbers"
2011: Denver Westwood, 2 May, "Denver Zoo buries time capsule in Asian Tropics, new elephant and tapir exhibit"
2011: Adelaide Advertiser, "Adelaide Zoo parties for World Tapir Day"
2010: First Dog in the Moon (originally printed in Crikey! 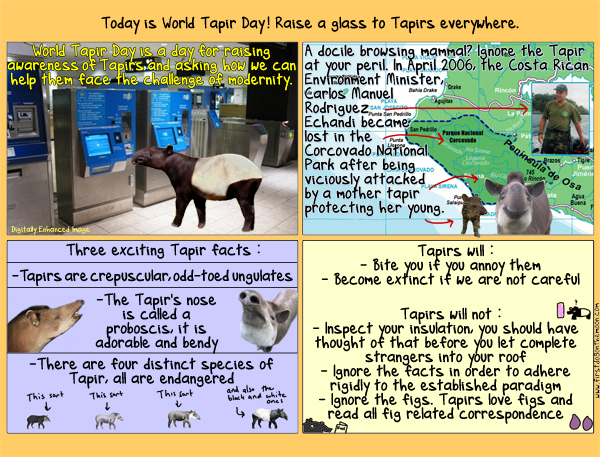 ), "Today is World Tapir Day!" 2010: Western Telegraph, "Celebrate World Tapir Day by joining Folly Farm's Tapir Trail"
2010: Cute Overload, "Follow your nose: it's Tapir Day!" 2009: Star Online, "Stop, look and learn more about the tapir"
2008: Cute Overload, "Happy WORLD TAPIR DAY!"